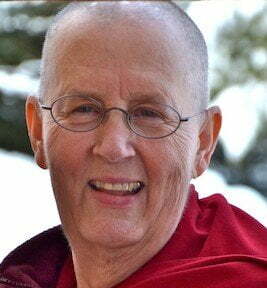 Venerable Jigme met Venerable Chodron in 1998 at Cloud Mountain Retreat Center. She took refuge in 1999 and attended Dharma Friendship Foundation in Seattle, where Ven. Chodron was the resident teacher. 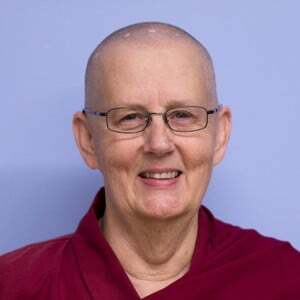 She moved to the Abbey in 2008 and took śrāmaṇerikā and śikṣamāṇā vows with Venerable Chodron as her preceptor in March 2009. See pictures of her ordination. In 2011, along with Ven. Chonyi, she received bhikshuni ordination at Fo Guang Shan in Taiwan. See the photos. Before moving to Sravasti Abbey, Venerable Jigme worked as a Psychiatric Nurse Practitioner in private practice in Seattle. In her career as a nurse, she worked in hospitals, clinics and educational settings. At the Abbey, Ven. Jigme manages the prison outreach program and support the health of the community. In addition, she is a photographer, technical consultant, thanks donors, and creates flyers and other graphics.